We’d love your help. Let us know what’s wrong with this preview of Wild Wood by Posie Graeme-Evans. For fans of Diana Galbaldon’s Outlander series comes a gripping and passionate new historical novel. Intrigue, ancient secrets, fairy tales, and the glorious scenery of the Scottish borders drive the story of a woman who must find out who she really is. Jesse Marley calls herself a realist; she’s all about the here and now. But in the month before Charles and Diana’s weddin For fans of Diana Galbaldon’s Outlander series comes a gripping and passionate new historical novel. Intrigue, ancient secrets, fairy tales, and the glorious scenery of the Scottish borders drive the story of a woman who must find out who she really is. To ask other readers questions about Wild Wood, please sign up. Hannah I'm about 1/3 of the way through it and there has been one scene that I just skipped. Besides that, there hasn't been anything else raunchy. "The past bleeds into the present." When Jesse Marley finds out she's been adopted, she leaves Australia and heads to Britain, her birthplace, to find answers and locate her birth mother. After she's involved in an accident in London she finds herself in hospital, under the care of Rory Brandon. But something strange begins to happen as right-handed Jesse starts drawing with her left hand. One drawing in particular of a castle, just happens to be one that Rory recognises as the castle on the estate where he grew up. Set in dual timelines - present-day, 1981 and the Scottish Borderlands, 1321 - the strength of Wild Wood, (like most dual timeline stories), lies in its historical thread. Dark and often forbidding the setting is gloriously depicted in all its violence and chaos of the times. Centred around the three Dieudonné brothers with the youngest brother, Bayard the first-person narrator, the story unfolds at Hundredfield, the stronghold and estate of the eldest brother, recently married to a woman his workers view with suspicion and distrust. The story set in 1981 is told in present tense, which to my mind comes off somewhat awkwardly. But this could be just my personal bias. Though interesting, it’s outshone by the historical story with its mystery, mystic tales and realistically grim atmosphere. For fans of Diana Galbaldon’s Outlander series comes a gripping and passionate new historical novel. While I understand publishers wanting to use this enticement, I also think they should be very careful that the novel lives up to expectations of Outlander fans. Having read Outlander ten or so times, I think some readers may feel somewhat disappointed here. However, Wild Wood does have its merits. The ending was particularly gripping as all the threads, past and present are woven together and answers given. A good read, and recommended to readers who enjoy dual timelines, straight historical fiction and romantic historical fiction (lite on the romance). It’s 1981 and Jesse arrives in London amidst the lead up to the wedding of Charles and Diana. Jesse is on a quest to find out who she really is. A quest which takes her from Sydney, Australia to the wilds of the English borderlands! 1831. Bayard and Maugris return from battle to find their older brother has wed and is ruling the estate, Hundredfield, with a cruel hand. A hauntingly captivating story spanning centuries. Steeped in superstition, the supernatural, myth and legend it takes the reader It’s 1981 and Jesse arrives in London amidst the lead up to the wedding of Charles and Diana. Jesse is on a quest to find out who she really is. A quest which takes her from Sydney, Australia to the wilds of the English borderlands! A hauntingly captivating story spanning centuries. Steeped in superstition, the supernatural, myth and legend it takes the reader from the 14th century to the 20th century. The style of writing changes as the story moves back and forth between 1831 and 1981. The present told in third person whilst the past is in first person narrated by Bayard Dieudonne. I liked the different styles and found the change easy to adapt to. It also helped set the two stories apart. I loved Bayard; he is very sensitive and guards his true feelings from those around him. It wasn’t a time of sensitive men. He quite often bares his soul and you will find yourself on his side. I could have quite happily read a whole story on Bayard alone. Jesse’s side of the story started slow and confusing which was a reflection of Jesse’s state of mind. As one side of the story gathers pace so does the other therefore, not leaving one side flat. Some chapters left me breathless as they battled against raiders and harsh winters, a constant battle to stay alive. These people were devout Christians and the description of the 14th century Christmas dinner was marvellous. Some readers may work out the twists and family secrets but I’m never good at that so I had no clue to the final revelations. Well I though I had a clue but I was completely wrong! As the story evolved the pace quickened and I could almost feel Graeme-Evans exhaustion as the books ends. She has put a lot into this story. It’s very draining emotionally. Although, it’s not all high drama! There are elements of underlying humour and I laughed out loud as Graeme-Evans slips a fart joke in amongst the drama. I recommend this book to everyone, no matter what genre you read I am sure you will enjoy “Wild Wood”. Thank you to Netgalley and Simon & Schuster for my copy to read and review. 1981 in London, Jesse Marley had just arrived from Sydney, Australia – distraught and filled with tension, she had just discovered her whole life had been lived on a lie. She was adopted, and had only just found it out. Plus not even her birth date as she knew it was correct. She felt betrayed and was desperate to discover who she really was. Her new birth certificate showed her place of birth as Jedburgh in Scotland so she knew she needed to go there to find answers. In her distressed state she stepped into the path of a motor bike and was run down. The subsequent events; from her meeting of Dr Rory Brandon, neurologist, at the hospital in London to her eventual arrival in Hundredfield in Scotland; there were strange and unsettling things happening to Jesse. Why did she feel she knew the old castle? Who was the woman she continued to see in her dreams? And could she find her birth mother and find out about her past? This historical fiction novel by Aussie author Posie Graeme-Evans is full of intrigue and tension. The story is told by Jesse in 1981 and Bayard in 1321 and switches from past to present with ease. I thoroughly enjoyed Wild Wood and have no hesitation in recommending it highly. Recommends it for: All lovers of a good read. Recommended to ☼♄Jülie  by: Self. Told in two time frames, across historical borders this story does not disappoint! Australia 1981 and Jesse Marley has just discovered she was adopted at birth in the UK and raised in Australia. Against her parent's wishes, she makes plans to travel to the UK to find her birth mother. Anomalies on her Australian birth certificate raise suspicions so she uses the information she has so far gleaned to order a British birth certificate, which she doesn't get to see until she arrives in the UK. Upon her arrival in London things soon start to go pear shaped for Jesse when she is quite suddenly and accidentally struck down by a motorbike whilst crossing a road, then, after some confused wanderings she finds herself in a pretty serious condition in hospital, suffering from broken bones and a head trauma. Now Jesse's life seems to take on a direction of its own as she is propelled along by forces she can't seem to control. As one thing leads her to another she finds herself embroiled in a history she had no prior knowledge of, and...since the accident, an unusual talent has manifested in her, as well as what seems to be a memory recall which confounds both her and her doctor, Neurological Surgeon, Rory Brandon. Now Jesse finds she has become a patient of special interest to Dr. Rory Brandon, who wants to continue her treatment in private, and on a different level. Dr. Brandon has recognised some of the information that Jesse has unwittingly recalled and wishes to pursue it further by taking Jesse away with him for awhile, to a location which he believes is significant to them both, to assist in her recovery and to facilitate his psychological evaluation of her condition, which he believes is unique. 1321, and the de Dieudonné brothers, Godefroi, Maugris and Bayard are meeting at the Hundredfield Castle on the Scottish/English Borderlands. Godefroi is the eldest of the brothers and now rules this Norman built stronghold with his new wife, much to the chagrin of his followers. It would seem that Godefroi has been overspending on renovations to the castle and has left his people to go without. There is much unrest in the village as the lease holders struggle to survive and slowly desert their ruler by leaving the village in search of a better living. When Maugris and his younger brother arrive at Hundredfield to visit their brother, they are surprised and concerned about the current situation. Things appear to be spiralling into rapid decline. This story is told by the youngest brother Bayard. What is the connection between Jesse and Hundredfield? And where does Dr. Rory Brandon fit in? Skillfully blending history and legend with myth, as the Lady of the Forest of Hundredfield is brought into play and the two stories begin to show similarities across time, Posie Graeme Evans has done a marvelous job in weaving all threads of the stories in concert with one another. The language between cultures changes realistically as the story flows between the centuries, and the wonderfully graphic descriptions, and depictions of 13th century life in the borderlands are easy and glorious to visualise. The characters were well rounded and aptly presented in all their various complexities. I was thoroughly immersed in this book and even enjoyed where it was switching between time frames as the story progressed. It was a real page turner that kept me spellbound to the end. Jesse Marley is a person on a mission, when she applies for a passport there is a discrepancy with her date of birth. Wondering what it means she confronts her parents to find out she is adopted. Determined to get to the bottom of what happened to her birth mother and why she gave her up, she heads for England. Once there she sets out to find where she came from but the fates have other ideas, instead of wandering aimlessly, not knowing where the start, her life begins a journey that will shock and change everything she ever believed about herself and her family. When she is involved in an accident, she changes from a level headed person who knows herself, to someone who seems to know people and places that she had no previous knowledge of. The changes make Jesse question her very sanity, but the kind doctor that treats her in the hospital, Rory tells her he will get to the bottom of it all. Little does he know how much the change in Jesse will affect him and the people around him forever. This is a story that for me took a long time to get into. I found myself distracted with it until about half way through. I loved the idea of Jesse being placed under hypnosis to explain how and why she had the ability to produce images of people and places she had never seen before. I thought that the author could have maybe used the idea more to explain what happened in the past and what was currently happening to Jesse, instead of having so many chapters to describe what happened. It would have been more interesting to have flash backs whilst Jesse was hypnotized. Apart from that I thoroughly enjoyed this tale of mystery and family secrets. This is the first novel that I have read by this author and I believe it will not be my last. With her emotions running high, she steps into the path of a motorcycle. Pretending she is fine, she bumbles her way into an old church and comes across a waitress named Alicia Donne, who arranges for a doctor friend, Rory Brandon, to help Je Australian woman Jesse Marley is in London in 1981, at the height of England’s celebrations for the upcoming marriage between Prince Charles and Lady Diana Spencer. A month earlier, her world had been turned upside down by the discovery that she was adopted. Growing up in Australia Jesse Marley was shocked when she accidentally discovered that she was born in England and adopted at birth. When her parents refuse to tell her anything about her birth or original family, she travels to the UK to find out the truth herself. However, after an accident results in a head injury and hospitalisation, Jesse finds herself listening to a strange inner voice and drawing detailed pictures of a castle and place she has never seen. This story is told in two time fra Growing up in Australia Jesse Marley was shocked when she accidentally discovered that she was born in England and adopted at birth. When her parents refuse to tell her anything about her birth or original family, she travels to the UK to find out the truth herself. However, after an accident results in a head injury and hospitalisation, Jesse finds herself listening to a strange inner voice and drawing detailed pictures of a castle and place she has never seen. This story is told in two time frames, Jesse's quest to find more about her birth in 1981 and that of the Norman family Dieudonné in 1321. That there is a link between the events that nearly destroyed the Dieudonnés and their family seat Hundredfield, and Jesse's tale in current times becomes clear as the stories progress. Both stories are engrossing and filled with great characters. In 1321 Hundredfield is ruled by the oldest Dieudonné brother, Godefroi who is proud and arrogant but totally smitten with his new wife, the middle brother Maugris, a fighter and strategist and the youngest Bayard, the narrator, who is more caring and sympathetic to the plight of the peasants in the village who are slowly starving to death. Hundredfield is surrounded by ancient woods and superstition and ancient tales such as those of the wild faery Hunt and the Lady of the Forest who appears when she is most needed are deeply ingrained in people's beliefs in the 14th century. They also still linger in modern times when Jesse finds herself visiting Hundredfield in her quest to unlock her family secrets. The writing was very evocative, giving a real feel of the harshness of 14th century life in a cold stone castle and the wildness of the woods and countryside. The two interwoven stories were told in different narrative styles which made it easy to follow the changes between the two threads and switching between the two parallel stories also helped to maintain the tension in each story. Definitely a page-turner! Brandon, is intrigued. Especially once he recognises the castle. Thus begins Jesse’s journey: to a place called Hundredfield built a thousand years earlier by the Normans near the border with Scotland. What is Jesse’s connection to Hundredfield? Can Rory help her find the answers she is seeking? The story moves between the present in which Jesse is trying to seek information about her past, and a period some hundreds of years earlier when the marriage of a mysterious woman to a lord of Hundredfield seems to initiate a series of inexplicable events. How are these two stories connected? I enjoyed this story, and kept turning the pages trying to work out how (and through whom) Jesse was connected to Hundredfield. There’s mystery, a hint of romance, as well as some interesting characters and events. The shifts between past and present maintained the tension and kept my interest. There are a number of twists and turns, and plenty of surprises. I’ve read Ms Graeme-Evans’s earlier works of historical fiction and found them thoroughly entertaining. for the opportunity to read an advance copy of this novel. Wild Wood is a dual narrative that draws you in from the very beginning and I was entranced by the hulking presence and history of Hundredfield; located on the Scottish borderlands. Jesse is the key to the past and her narrative in the 1980s is read alongside that of Bayard, a male character in the 1300s. I'll readily admit that I didn't want to leave Bayard's chapters at all, and each time I had to leave for one of Jesse's chapters I cried out nooooo in my head. I wanted to stay with this battl Wild Wood is a dual narrative that draws you in from the very beginning and I was entranced by the hulking presence and history of Hundredfield; located on the Scottish borderlands. Jesse is the key to the past and her narrative in the 1980s is read alongside that of Bayard, a male character in the 1300s. I'll readily admit that I didn't want to leave Bayard's chapters at all, and each time I had to leave for one of Jesse's chapters I cried out nooooo in my head. I wanted to stay with this battle-hardened warrior and was desperate to find out what was going to happen to him, his brother Maugris and strange, mute wife. Posie Graeme-Evans' Wild Wood is a gripping parallel narrative set in the border lands between Scotland and England. The prologue begins with the Norman Fulk's conquest of local Saxons and the building of Hundredfields Keep on top of a sacred spring. 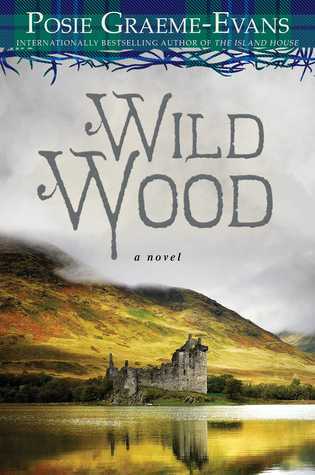 The narrative then splits between the modern story - set in 1981 just before Dianna and Charles wedding - , where Jesse Marley begins her search for her birth parents, and the fourteenth century when the three Dieudonne brothers desperately defend F Posie Graeme-Evans' Wild Wood is a gripping parallel narrative set in the border lands between Scotland and England. The prologue begins with the Norman Fulk's conquest of local Saxons and the building of Hundredfields Keep on top of a sacred spring. The narrative then splits between the modern story - set in 1981 just before Dianna and Charles wedding - , where Jesse Marley begins her search for her birth parents, and the fourteenth century when the three Dieudonne brothers desperately defend Fulk's holdings against the disgruntled peasants and underling rievers. Woven through both stories is the legend of the lady of the forest. But let me take you back a little…Before her journey to the borders she is in England and has an accident. The doctor who treats her is a neurologist discovers Jessie has certain abilities through hypnosis …was it caused by her accident? While in the hospital Jessie draws these pictures of a castle-the castle I mentioned above- and the doctor knows this place all too well. He convinces her to go with him to the castle. So off they go to the borders and their adventure is quite extraordinary. Meanwhile, the owner of the castle, Alicia is doing everything she can to keep the castle-due to financial difficulties- must make tough decisions. But you don’t know for sure what decision she is going to make until later on… Another thing I like about this story is that this castle and land is deeply connected to all the main characters in this story. I really like Alicia and she is probably my favorite character in this book. The story takes you back and forth between the 14th century and the 20th century. It is steeped in deeply buried secrets, loss, fairy tales-more like mystical to me-and so much more. I believe the author does a wonderful job writing about the past and the more modern times. I was truly captivated with the historical events in this story and I love the atmosphere, characters, and intrigue the author writes and I must say there are a few twist to the story that let me guessing a few things until almost right up to the end….and that is rare for me. I admire that greatly in this story and it certainly kept me up late at night reading on to find out more…I didn’t want the story to end. This is the first book I have read by this author and I am so glad I discovered her. I will definitely be reading more books from this writer and I highly recommend this story. I’ve rated this book four and a half stars! I fell in love with Posie Graeme-Evans' writing almost 10 years ago after reading her War of the Roses trilogy. The cover of Wild Wood called my name, blessed by the cover fairies with what looks to me like Eilean Donan Castle. Then of course I noticed the author's name and when I finally read the synopsis, I was sold. And not disappointed ... this Australian author's writing has evolved over the years and Wild Wood is a beautifully refined story, compelling and evocative. 1321 in the borderlands, the story unfolds at the Norman stronghold Hundredfield, held by Godefroi, eldest of the three Dieudonné brothers. The story is narrated by the youngest, Bayard. I loved his character; battle-hardened knight, his strength, compassion and sensitivity endearing traits. 1981 Jesse Mayard's world is rocked when she learns she is adopted and leaves her home in Sydney, Australia determined to discover the truth, and herself. Heading for Jedburgh in Scotland, fate intervenes bringing Jesse and Alicia and her neurologist friend Rory Brandon together, setting Jesse on the path to Hundredfield. In a dual time line story I normally find one story appeals more than the other but with Wild Wood I was equally intrigued by both. I was immediately hooked on Bayard's narration, page-turning, breath-holding reading, the setting and times, violent, harsh and unforgiving. Jesse's narration was a quieter pulling, until Hundredfield exerted its influence. Wild Wood has its faults but maybe visiting Scotland gave the story and Hundredfield a whole lot more 'feel' ... history literally seeps from the walls of these ancient castles and ruins, it can be quite emotionally overwhelming. It was lovely to revisit that feeling with Wild Wood. Lose yourself in this outstanding tale of love, loss and the power of fate. Aussie Jesse Marley’s search for her British roots is cut short when an accident sends her to St. Bart’s Hospital with a broken clavicle and concussion. Unable to communicate and forced to use her left hand to write, Jesse unlocks a talent for drawing; something she’s never mastered before now. But it’s what she draws that brings her closer to the secret of her birth. It’s a secret that echoes deep into the medieval past Lose yourself in this outstanding tale of love, loss and the power of fate. Aussie Jesse Marley’s search for her British roots is cut short when an accident sends her to St. Bart’s Hospital with a broken clavicle and concussion. Unable to communicate and forced to use her left hand to write, Jesse unlocks a talent for drawing; something she’s never mastered before now. But it’s what she draws that brings her closer to the secret of her birth. It’s a secret that echoes deep into the medieval past of the Scottish Borders and entwines her in the life of the two people she was fated to meet. Though Jesse is the catalyst for all that unfolds in Wild Wood, this is essentially a story of place—the medieval stronghold of Hundredfield. Drawing on pagan mythology, history and a multifaceted plot, Graeme-Evans creates two captivating storylines. As Jesse discovers her own past, the events of six hundred years ago begin to emerge. These events are narrated by Bayard, lord and knight of Hundredfield in 1321.The risk with such a structure is that one storyline or character dominates the other. Bayard’s world is less familiar and so richly described that it could dominate Jesse’s more contemporary story, and lovers of historical fiction may discover a preference. I was as equally interested in Jesse’s story as I was in Bayard’s. At the end of each day it was a pleasure to escape into the world of Hundredfield and its mysteries. Graeme-Evans is a wonderful storyteller. Wild Wood is a seamless blend of mysticism, romance and history, richly imagined and beautifully executed. I received an advance copy of this book from NetGalley in return for an honest review. The beginning of this intriguing novel transports the reader to the windswept northern borderlands. It’s 1068 and William the Conqueror’s Norman bullies are spreading through the country, quelling rebellion wherever they find it. We witness the harsh stamping of their authority through the eyes of a frightened child. Hers is an important task; she must run to the sacred pool and make an offering to The Lady of I received an advance copy of this book from NetGalley in return for an honest review. The beginning of this intriguing novel transports the reader to the windswept northern borderlands. It’s 1068 and William the Conqueror’s Norman bullies are spreading through the country, quelling rebellion wherever they find it. We witness the harsh stamping of their authority through the eyes of a frightened child. Hers is an important task; she must run to the sacred pool and make an offering to The Lady of the Forest. To plead for her protection. But the soldiers come and with their leader, Fulk, desecrate the holy place just as they plan to violate the women praying in the village. From this bleak starting point Posie Graeme-Evans weaves together two narratives separated by hundreds of years. In 1321 Bayard Dieudonné returns home to his family’s imposing castle after two years fighting border reivers. He finds a new addition to the household; a bewitchingly beautiful young woman. Enigmatic, silent, pregnant. Then we meet Aussie abroad, Jesse Marley. It’s 1981 and the whole of London (the whole of the world) is anticipating the Royal Wedding. But Jesse is too preoccupied to speculate about what the dress will be like; she is struggling to find her emotional foundation again after making a shocking discovery. The Dieudonnés are descended from Fulk but where does Jesse belong? These disparate tales are told extremely well and the author has a deceivingly gentle, engaging style. She puts a spell on you and then cranks up the pace. You want to find out what happens to the main protagonists, to uncover the secrets of this haunting part of the world. So full of history, mystery, scandals and regrets. Wild Wood is an incredibly engaging read, but also a very slow read. It took me 4 days to get through it's 400-odd pages. It's also the rare novel where I found myself enjoying - and preferring - one storyline over the other: Bayard's tale was fascinating and I couldn't wait to return to it. While I wish there would have been more of a time travel element (especially since it's shelved as such on GoodReads) the expectation of one was completely my fault in not reading the summary properly. Posie Wild Wood is an incredibly engaging read, but also a very slow read. It took me 4 days to get through it's 400-odd pages. It's also the rare novel where I found myself enjoying - and preferring - one storyline over the other: Bayard's tale was fascinating and I couldn't wait to return to it. While I wish there would have been more of a time travel element (especially since it's shelved as such on GoodReads) the expectation of one was completely my fault in not reading the summary properly. Posie Graeme-Evans is a new-to-me author and my introduction to her work couldn't have been lovelier. Wild Wood is a novel to savor, to really sink into when it's blistery cold outside and you've got a cozy blanket and hot cup of tea. Though slow going, I enjoyed it immensely and look forward to reading more of her books! WILD WOOD is a dual timeline narrative that moves between the Scottish Borderlands in the 14th century and an unhappy young woman in the 1980s who finds herself compelled to draw the same Scottish castle over and over again. I love stories with parallel timelines, particularly with a good dash of romance, history and magic added in, and I love books set in Scotland, so all the ingredients were in place for a really wonderful read. I must admit I loved the scenes set in the past more – the story of WILD WOOD is a dual timeline narrative that moves between the Scottish Borderlands in the 14th century and an unhappy young woman in the 1980s who finds herself compelled to draw the same Scottish castle over and over again. I must admit I loved the scenes set in the past more – the story of the mute fairy wife, the battle-hardened warrior and the medieval castle were all so intriguing. The contemporary scenes did not work quite so well for me, perhaps because the 1980s is not a decade that really inspires me. What we have here is a book within a book. Unfortunately the story within the story is more interesting than the original story. I'm sorry, was that confusing? It was good until about half way through. Unfortunately the past was too awkwardly tied to the present and the mirror plot felt redundant. I feel that if the author had set the book either entirely in the 1300s or entirely in the present day it would have made for a much better flow of the story. So in short, borrow from a library. I really loved this book. I didn't know how I would handle the 14th century part of it but, as I love a story in split time zones, as the story proceeded I became more absorbed the complete story, in both times. if anything, this book has created a fascination for me in the history of earlier centuries that I will continue to follow. my particular interest and fascination in earlier times has so far limited me to my favourite period in time...the first decades of the 20th century. I WILL be reading more from this terrific Australian writer, oh yes indeed! Do not read if you expect something like Outlander. Nothing like it. It was a bit "meh". I love historical fiction. I can get lost in the pages of a well written book and I found myself lost in just such a book when I opened the pages to WILD WOOD, by Posie Graeme-Evans. This gem is a historical fiction with an overlay of not time travel, but not really fantasy either. It is a mix of folklore, historical fiction and an interesting current time mystery with just a touch of a love story to keep the love forlorn interested and turning the pages wondering who is going to get the cute young doctor. The old country in the north of England and in the south of Scotland is riddled with ancient sites. There are many moldery castles hanging on, despite the fact that they should have long since collapsed in a heap of rubble. Posie took this magical setting to use as a backdrop as she began to weave a story of an adopted young lady, Jesse, looking for her birth parents, a young and brilliant psychiatrist, Rory, who takes her under wing after an unfortunate accident leaves her with a head injury and a lot of unanswered questions. He whisks her off to one of these moldery castles up near the Scottish border. After they arrive, her dreams of the past intensify, about the very castle that they are staying in and she discovers that she has already met the owner of the castle, Alicia just before she landed in the hospital in London. The oddities just continue and grow more complex with the unwinding of the story. The mystery of the story that Jesse continues to reveal through the dream sequences of the Hundrefield during the 1400s is a wonderful historical fiction story, unto itself. It is well written, the characters multi-dimensional, and you can live, breath and smell the very essence of what it would be to live in Hundredfield with the Donnes during that time period. It is the very magic and essence of the Ancient Ones, especially the ”Lady of the Forrest”, that binds the two stories across the centuries, as she draws Jesse, Rory, and Alicia (the owner of the castle) into a more and more complex mystery in the present, even as the story progresses and becomes more poignant in the past. Each of the storylines stands well alone, as a wonderful mystery and love story. WILD WOOD is the masterful weaving of the two stories together, and the surprising, but logical conclusion of this book makes this complex novel a worthy read. Though at times not an easy read and at times it seems to bog down. History is not all excitement either. It is the hunger for the “answers” that kept me moving forward, for I knew that even these few sections would offer logical reason on retrospect at the end. Posie paid attention to detail in the development of her story, for each detail had a purpose and came back to answer an unsolved question later in the story. The face Jesse kept drawing, places in the castle Jesse knew about or could draw in detail that were pictures in old books in the castle library, these are small examples. There were little details like a white lock of hair in a character’s otherwise black locks. All of these small details were clues, they all had reasons. Small though they seemed, each was of some significance in the plot and storyline. Following those types of details and trails through a novel makes for exquisite reading. In this case it came to a true love affair with the story and characters between the pages. WILD WOOD by Posie Graeme-Evans is literary work of potential significance in this reviewer’s opinion. With a FIVE STAR rating, I hope that she gains the attention of the reading public. I highly recommend her work for the serious historical fiction, historical mystery, historical folk lore, adult literary fiction, and historical romance readers. The book is not a light read, but is worth the relaxing diligent read of someone ready to enjoy a well written literary work. The Scottish borders is the ideal backdrop for Posie Graeme-Evans sixth novel Wild Wood, which contains a beautiful blend of history and myth. The story opens in June 1981 (in the weeks just prior to Prince Charles wedding to Diana Spencer,) with Jesse Marley, a young, Australian woman who has just discovered that she is adopted and has travelled to Scotland to discover more about her birth. Meanwhile, another narrative tells of the same place in a different time in history. Bayard Dieudonne is The Scottish borders is the ideal backdrop for Posie Graeme-Evans sixth novel Wild Wood, which contains a beautiful blend of history and myth. The story opens in June 1981 (in the weeks just prior to Prince Charles wedding to Diana Spencer,) with Jesse Marley, a young, Australian woman who has just discovered that she is adopted and has travelled to Scotland to discover more about her birth. Meanwhile, another narrative tells of the same place in a different time in history. Bayard Dieudonne is a young man fighting for both family honour and to understand his new sister-in-law, a young mute woman who is despised by many. As Bayard's story goes deeper and deeper, we learn more about the history and a haunting local legend--which may just be brought to life right in front of Bayard's eyes. A twist of fate, in the form of a motorcycle accident, leaves Jesse in hospital and with some strange new abilities--such as her being able to draw with her left hand people and places that she has never seen before. Neurologist Rory Brandon is intrigued, particularly when Jesse starts drawing pictures of a castle that he knows quite well. But what does the castle, and a certain local legend have to do with Jesse? I thoroughly enjoyed reading Wild Wood from start to finish and watching as the duel narratives of Bayard and Jesse unfolded. Poor Bayard has his hands full with defending his family homestead (and putting up with an idiotic older brother,) while the mystery of Jesse's behaviour is quite interesting. Is she going insane? Is there something deeper at work? And does Alicia, the owner of the castle have the right to be suspicious? It was interesting to see how the duel stories connected--and they do eventually in quite a pleasing way. I loved seeing the history of The Borders being brought to life in such way and blended with a legend that was totally appropriate to the story. Maybe it is my family history--my ancestors are from the Borders--but I felt a real connection, or perhaps a pull, toward this story. I think that the author has a real knack for slowly drawing readers in and causing them to feel very involved with the story. I highly recommend this one to readers who want something historical ... with a twist. Thank you to Anna O'Grady from Simon and Schuster Australia for my ARC. Wild Wood is an intriguing story of one family’s existence through the ages. A family with a folklore that is living to ensure their continuity & maybe even prosperity. The novel spans 6 centuries of secrets hidden in a little town by the Scottish borders. This tale is told from 2 perspectives: Jesse in 1981 and Bayard in 1321. Jesse had recently found out that she was adopted and is in doubt of her identity. She is looking for her birth parents and by several incidents, she got to Hundredfie Wild Wood is an intriguing story of one family’s existence through the ages. A family with a folklore that is living to ensure their continuity & maybe even prosperity. The novel spans 6 centuries of secrets hidden in a little town by the Scottish borders. This tale is told from 2 perspectives: Jesse in 1981 and Bayard in 1321. Jesse had recently found out that she was adopted and is in doubt of her identity. She is looking for her birth parents and by several incidents, she got to Hundredfield where it all unfolded. Jesse is likeable enough though I don’t feel there was anything special about her. Her story felt pretty average to me –a bit slow to develop and not one character to really grab me except maybe one minor character. The twist about her family didn’t surprise me one bit either. I could see it coming a long way. Bayard’s story is the one that appeals to me in this novel. He was a man of war –that was his lot, being the youngest son of three. And yet, in the midst of battle-hardened men, he was considerate and surprisingly, gentle. His is a tale of brutality of the age, of superstition, and also, of love. I was quite happy with this perspective which really is the highlight of this novel for me. Expectations! It can easily wreck a book for you. I feel that this is what mostly let me down in Wild Wood. It has not got any time travel nor does the time-slip work out to be such. So, there is a bit of “magic” (of folklore) but it didn’t quite grab me. I like the premise of it but I don’t think the origin of it was explored enough –just that it’s there and how what happened in 14th century related to what’s happening now. It turned out to be a pretty average read as it was slow to develop, twists which didn’t catch me by surprise, and my inability to connect with the ‘contemporary’ characters. Running on dual time lines Wild Wood is true escapism. In 1981 when Jesse Marley accidentally finds out she is adopted, she cuts all ties with her adoptive parents and travels to England to find her birth mother. While there she is involved in an accident and suffers a head injury. Her doctor, Rory Brandon becomes intrigued when he discovers she has drawn some pictures of which he recognises the castle. He convinces her to undertake some hypnotherapy to discover what is happening and also to come Running on dual time lines Wild Wood is true escapism. In 1981 when Jesse Marley accidentally finds out she is adopted, she cuts all ties with her adoptive parents and travels to England to find her birth mother. While there she is involved in an accident and suffers a head injury. Her doctor, Rory Brandon becomes intrigued when he discovers she has drawn some pictures of which he recognises the castle. He convinces her to undertake some hypnotherapy to discover what is happening and also to come with him to the place that she has drawn. In the 14th Century the inhabitants of Hundredfield are spooked when Lord Godefroi marries Lady Flore, She is a woman whom Godefroi found in the forest who does not speak. They believe she is possessed but Godefroi is utterly captivated by her. This narrative is told by the Godefroi's youngest brother Bayard. I really enjoyed the two time frames. I'm not a great historical lover, so I'm always more intrigued with the contemporary story line. But both of these were written smoothly and I my attention was held in both narratives. This had a bit of everything....supernatural, mystery, romance, small town secrets and I really enjoyed seeing how all of these came together. I could see where the story line was going but at the end there was one surprise that made me smile.